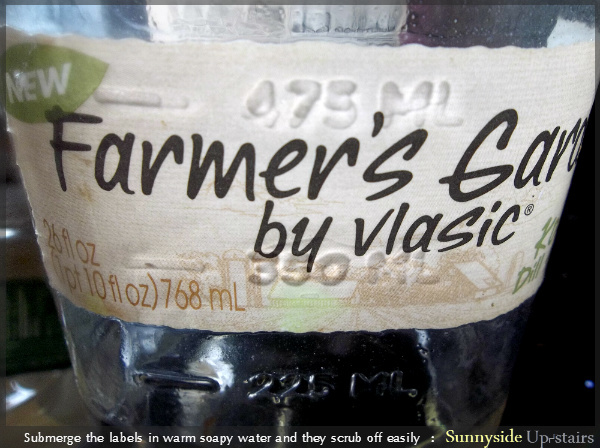 My husband enjoys Farmer's Garden pickles by Vlasic, so we've made a habit of travelling to the closest grocer that carries it once a month. It's the one pickle jar that I like the look of, so much in fact, that I started using them to store our dry food goods. 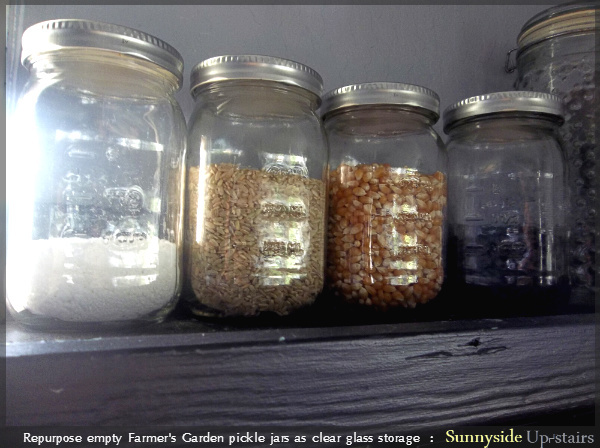 Since these are mason jars, they're the best repurposed food jars we've found to reuse for storage, without needing to do much else than eat its contents and sanitize the jars. We've lived upstairs since April, so we literally have saved a jar per month while living in our apartment. 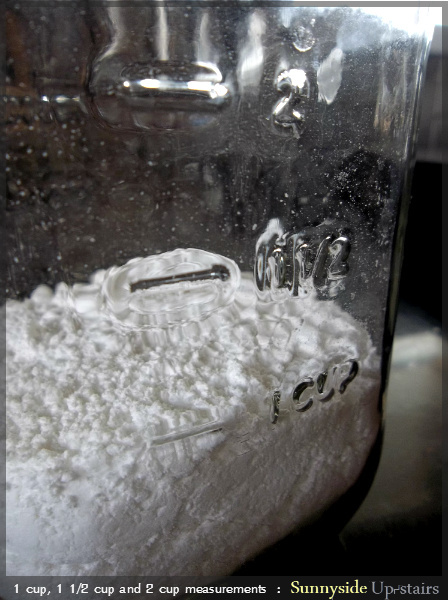 :) Currently, we're storing: confectioner's powdered sugar, organic brown rice, popcorn kernels, and coffee beans. The mason jars reinforce farm-to-table style, including mL and cup measures up to 2 cups, so you can estimate what volume of goods are left. 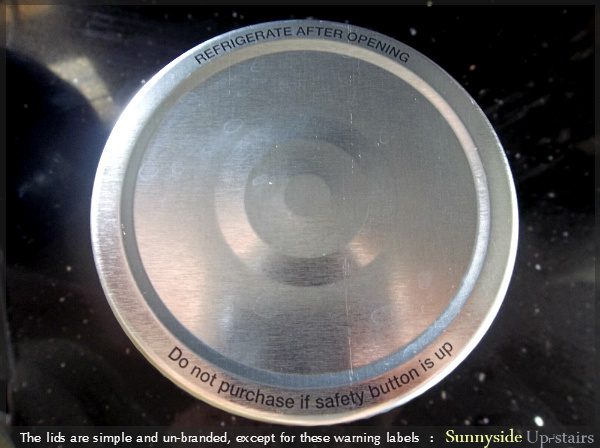 The glass and metal lids are unbranded, but do still display typical safety labels. However, they are not visible when on the shelf, and the silver lids coordinate well with our kitchen, so I have decided to not spray paint them. Very stylish way to display and save! Pottery Barn charges $9.95 each for jars similar to these. It's also a neat remembrance of each month in your new home. Can't wait to see your kitchen ledge shelves! And Pottery Barn's didn't even have a top! They showed it with a votive candle and a little twisted wire for a handle. (Cute, but not 9.95 + tax + shipping cute ;) The food analogy makes me think of ways to use this kind of jars for food gifts -- like a wedding shower gift with a different jar of goodies for each day of the Honeymoon, maybe their initials painted on, hmmm.. I'm going to write that one down, it may work for other occasions too. :) I always get new creative ideas from your blog! That is an awesome tip. 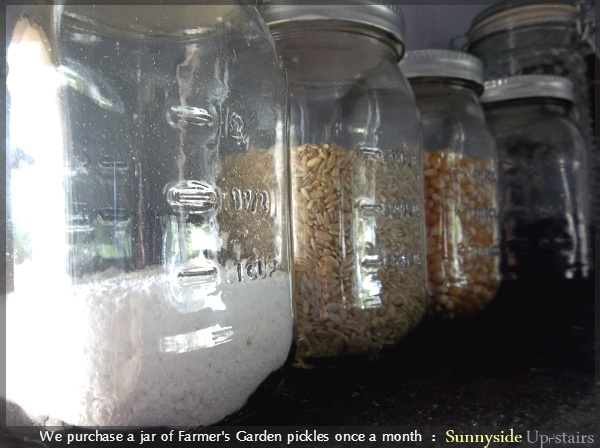 Now I wish we liked pickles :) I love that you have your flour etc stored in glass and not plastic. So much healthier. I need to find someone who likes pickles LOL. Your comment made me smile so wide, Katja. =D Haha. I wish you well on your quest to find a pickle-loving friend!